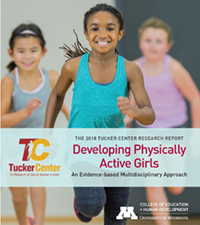 To celebrate our 25th anniversary we released The 2018 Tucker Center Research Report, Developing Physically Active Girls: An Evidence-based Multidisciplinary Approach. 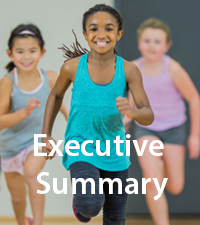 This report connects research-based knowledge to strategies and practices which helps ensure that every girl has ample opportunity to fully engage in sport and physical activity. The overarching focus of the report examines two essential questions: 1) What does the research tell us about critical factors (e.g., societal, environmental, interpersonal, intrapersonal) that influence adolescent girls’ physical activity in the United States; and, 2) What are the outcomes (e.g., psychological, physical, social, emotional, moral) that participation in sports and physical activity have on adolescent girls? The scope of our 2018 Report includes eleven chapters written by leading multidisciplinary scholars. Evidence-based chapters include psychological, sociological, and physiological dimensions of girls’ physical activity participation, as well as chapters on sports medicine and the influence of mass media on girls’ health and well-being. Because “girls” are not a singular, monolithic group, chapters focus on girls’ intersectional identities and include invisible, erased, and underserved populations such as immigrant girls, girls of color, girls who identify as lesbian, transgender or queer, and girls with cognitive and physical impairments. 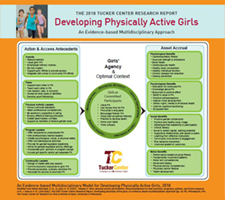 The report contains the Ecological-Intersectional Systems Model of Physical Activity for Girls, to guide thought and organize the vast literature about girls’ physical activity participation, and ends with a Best Practices chapter and a Positive Model for Developing Physically Active Girls to guide program development, interventions and research.